April | 2014 | CAN YOU HEAR ME NOW! I’m Really Sick – Be Back Later In Week, So Sorry! Harmony, Unison Between Believers & Unbelievers ~ Is It Possible? Is It Real? Hi friends…I hope this finds all of my friends happy, healthy and walking strong on their path today or better yet, I hope everyone is running their race to the Banner of Love steady and strong – getting ready to now sprint fast and hard to that finish line! That is where we are and that is how we must arrive at that “spot” the Lord Himself has ordained us to be. This day is fast approaching and I know we can all feel it from our toes to the very top of our heads! Now, what do we, as the Bride of Christ, need to be doing? What do we need to know? First, listen to the videos I posted yesterday, especially the one where I speak about the unequally yoked pairing and how we can no longer walk or reside in “their” world…it holds no beauty, no joy, nothing of importance to us any longer while our world, which is in the spiritual realm, God’s Realm, cannot even been seen by their eyes nor can they hear any words spoken on it’s behalf. They do not even recognize our world and we cannot live in theirs – so ask yourself, how can that union, friendship, partnership, marriage, etc., be fruitful and/or harmonious? Unless Jesus Himself blesses it and pours His Spirit upon it, it will always be a battleground of good vs. evil, spirit vs. flesh and God’s Law’s vs. man’s laws and so on…Whew…I’m exhausted just thinking about it, aren’t you? Right now, one is either IN or one is OUT – bottom line, and because we love unconditionally all around us, we continue our relentless “Savior-type-mission” towards these people day after day, thinking that maybe, just maybe, today will be the day they “see-the-Light”! Well again, we need to imprint this into our brain – WE HAVE NO POWER to save anyone as we are not anyone’s Savior, not even for ourselves can we play this role for and it is only when the Lord decides to remove the scales/blinders from their eyes and the cotton from their ears will they truly have sight and hearing for and in “our world”. You, we, must know when to say “WHEN”, right? So repeat after me…”WHEN”! Give them all over to the Lord right now and move forward believing He has them…just be and let Him do! Remember this too, not all are God’s Children and some of us may very well be married to, friends with or in a relationship with one of these “others” but just not aware of this fact. Now is the time for us to prepare our fields for a record-breaking Harvest that is about to be removed from the fields. Now is the time to be truly alive in the Word of God…truly bring the Word alive in us so we can do all He needs us to do and to bring all the Promises He has given to be manifested. We cannot again, truly fathom all the treasures and riches, nor the “good gifts” that await us in Heaven that will be given to us by the Great I AM, The Glorious Father who sets on the Throne of Heaven, Himself! Can you just imagine how excited He is knowing all He has prepared, gathered and placed in our Treasure Troves just sitting there waiting? Oh my…it’s like a parent’s excitement in the anticipation of seeing their children’s faces when they finally get to open those Birthday or Christmas presents they bought, wrapped and have waiting to open so long ago! Just sit there imagining this in your mind – picture it, just see His Love that is about to burst out of the Heavens as our Father, the God of Abraham, Issac and Jacob waits ever-so-patiently for this day to come. Right now, today and the days ahead, we need to fill our hearts with love – love for each other and love for our neighbors and love for ourselves. We need to be ready to open our mouths in a moment’s notice and recognize the strangers placed in our paths and how to again, determine and discern, which of those were sent by the Lord and which were sent by Satan. How can we know this – how do we find this information out? We speak to them! We open our mouths first in whatever way is comfortable and necessary for each situation as not all are the same so pray, ask the Lord to give you the “tools” needed to allow His Will to be done and ask for His Spirit to be your “Bell Ringer” and your “Breadcrumb Alert”! We all miss opportunities throughout our walk, our life, in which we knew, only after the fact, that God wanted us to speak a Word to this person or to that person but because of fear we all have, we allowed those “placements” to be ignored…we have all done this! Please do not dwell on this and allow guilt to consume you because again, Jesus has this! If that person is marked by God, one of His, He will have a “re-run”, a “do-over” in that person’s life and will place another Believer, another of His Sheep, in their path so they will see and hear what was intended to be delivered earlier. See how He works! Okay, back to what I was saying about our loved ones, friends, etc. Many of these people may truly have a Divine-Heavenly transformation overnight, I’m in no way saying this cannot nor will not be done and I absolutely believe it possible, but, I’m touching base here on those that say they have changed, but in reality, they have not – they have become a “wolf-in-sheep’s-clothing” and will pull your focus, attention and eyes off the Lord whenever and however they can. Change is hard and it takes time!! If a person has truly changed, it will not be overnight, unless of course it was Divine which I’m not saying can’t happen, but be aware when they are just trying to fool you. A person cannot keep up a facade’ forever and usually, the person they were and still are will reappear within 4 to 8 weeks after. Many Believers are having strongholds, battles within their partnerships on a daily basis now, many of these are ending and if you have a “control-freak” in your mists, well to them, it’s all about “winning-the-game” and not about God and true change. They do not want to lose. Keep this in your mind as your heart will want to badly believe what they say is true. Tears do much damage and when they are poured out, we cannot stand it, especially coming from a person who is not a “crier” and when these people use tears as their last card ditch to win, we just crumble and start to feel guilty about wanting to leave or change our situation, making it impossible to do so now in good conscience. They cried! Sound familiar? Remember again the video I posted yesterday where I talked about this and that this is why Jesus comes to judge the hearts – this is so He can see and show who is truly remorseful, honest and seeks forgiveness because again, the heart cannot lie. Do not let the enemy and those he uses to attack the Children of the Lord, to fool you – to deceive you because we are in the Time of Deceiving, are we not? How does this hurt us? If we think the changes taking place are from our Father in Heaven, which then makes change and relocation next to impossible, we have allowed the guilt of their Salvation to consume us, making us fear and live in that fear that we are their last hope…that if we don’t “feed” them, they will be lost forever. Wow, this is a heavy weight to carry! Let me ask you this – how can you/we carry this upon our shoulders when we can’t carry our own? Aren’t we suppose to give Jesus our burdens as they were not meant for us to carry? Yep, we sure are! But now, we have the Ultimate Burden of Guilt of Salvation for others that will most definitely weigh and cripple a regular man/woman who believes in this way. How can you walk light, joyful and love others throughout the rest of our days if we cannot take one step forward from all we have taken onto our small, fragile frames? Then, if or should I say when, that ole’ Ike Turner (that is what I call both men and women who fake change for their own selfish reasons) reappears within or a little after the time-frame stated above, you/me will be devastated to find out that it was not sincere or worse, not from God Himself as you previously wholeheartedly believed. Next, you become angry, confused and doubtful which between the three, will then keep your attention on just why you didn’t see it, how blind and deaf you were for your lack of knowledge/discernment in this matter and then, another type of guilt, sorrow will set in and keep you from communing and walking daily with the Lord. This will now make you feel unworthy of your standing or mad at God for the scales over your eyes…take your pick! DISCLAIMER: Please know this – in no way am I condoning divorce or separation or telling anyone to leave another…what I’m saying is to 1) be aware of the daily conflict that comes with partners, friends, family who live in this world, the world where one is led by the flesh and you/us who live and dwell in the Spiritual world of God and God’s Holy Spirit, which is where you walk when you walk in the Spirit. Also, I’m saying that change takes time, and you need to have eyes wide open at all times when all-of-a-sudden, the person(s) you are living with who just the other day hated God, now suddenly are all “ga-ga” over Him, IF it coincides with you wanting to leave or change your living situation. If these are the same people that were trying so very hard to keep you from your God, our Heavenly Father and our Lord Jesus Christ just last week or 2 days ago, but now, they are “all-in”, pray about this, give it to God but be aware of the wolf in sheep’s clothing. If the change is true, honest and allowed by our Lord, then Praise Jesus, literally, but time will tell on this matter as they will not be able to keep up the farce more than 4, 6 or 8 weeks tops. Their true nature and reasons will be brought to a head, I guarantee it so watch and be watchful at all times. Minister to them, teach them and see their reactions to all you do – do they really want to know Him – are they interested or uninterested in what you are sharing and how is their patience level…this is what will show you what you need to know. If this sudden “miracle-change” was brought on by a specific circumstance, a certain situation within the relationship, pray for Divine Discernment in this matter but please, please be watchful. We know Jesus can do all things – make all things possible and does bring change to those who are marked by God at birth so they will now see whatever it is God predestined them to see. I truly hope as always, this is the case in each and every person, but, realistically, not all are changed in this manner…just saying. This has nothing to do with those who have been in the process of changing – those who have taken baby steps, yet still have open hearing to what you share regarding Jesus and His Kingdom and the days in which we live. These brothers and sisters have started a true walk to the Lord but it’s just been a slow, steady pace, many times falling back, yet they still are moving somewhat forward. These are not the ones I’m speaking of. I’m talking about a transformation from Dr. Jekyll and Mr. Hyde! 2 New Video Posts: Changes In Loved Ones~Are They Faking Or Is It Divine? Wolf in sheep’s clothing in your home? Just a quick note I would like to send out and share. One of our Blog members, Rob Schilling who was one of the first ones to support this site, has decided to “cross over to the LIGHT side”! Rob has decided to record some video messages, answering questions regarding the Lord, Heaven, what is expected of us, etc., and answer any questions anyone may have. How awesome is that! I have subscribed to his You Tube site and just over-the-moon Rob is stepping out and out-of-his-comfort-zone so he can speak and share all things God and his decision to open up, sharing what Jesus has done in his life, hopefully being able to help others who have walked where Rob’s feet have tread or at least taken similar steps. Oh, just for the record, Rob did admit that it is much harder than it looks! Also, he states in his video that he promises not to carry on and on and on like I do! (LOL) Too funny Rob and I know you are just a good, kind and loving man so I forgive you for that statement! No, I am just teasing you and you can say whatever you want about my rambling and talking too much, really, go right ahead! No, seriously Rob, I’m behind you 1000% and I hope every one will get behind him and support him…or at least until he starts talking, you know, like “Mary Beth does”, on and on and on and on…………(smiling and laughing the entire time I’m writing that)! This is encouraging to all as inch by inch, bit by bit, we are leaving our “comfort place” and venturing out into this world, speaking out to others and standing proud and firm in our faith and belief in our Heavenly Father and our Lord Jesus Christ. We are “sharing” all we can in these final days with anyone and everyone we can, praying the Lord removes the scales from their eyes and to allow hearing into their ears…this is a good thing! We all need each other because when you think about it or better yet, look at statistics, we are the minority, the very few that believe as we do and as I’ve said many times over, it’s a lonely walk but a journey I would never ever give up on or quit walking in – I just could not imagine my life without the Holy Spirit guiding me, teaching me, blessing and loving me – just can’t imagine that life or life path. Now that my friends, is a lonely walk! Never forget this friends, we now may be the exception, but one day soon, we will be the rule! First, let me apologize for the delay in posting but I just have had no free time – to put it bluntly…I’M POOPED! The other day, I sat down and did a quick video message but did not post it until today so excuse me for being a few days off when you see it. It’s been an exhausting week, not only physically, but mentally. Now, having said this, it’s no different than any of your days/adventures/attacks, etc. We all go through major ordeals and in no way am I saying that this is “so much worse” than anyone else”s! I’m not going to be a “Scarlet O’Hara” and think everything that happens is “all-about-me” either as I know I am not the “exception”, but the rule! These trials, these tests may be worse for me this week, while many of you have had lesser trials, but next week, or the week after that, maybe even next month, many of you could or will experience worse – I’m just sharing mine. I know that I speak so much about my daughter and my new granddaughter she is carrying, with her birth date quickly approaching on June 1st, but I am all she has. You all have been so wonderful as I give you no choice but to endure my many stories, tears, triumphs and concerns regarding both children, my son Taylor and Tara. I’m aware too that I do not mention the father of the baby and why he is not in the picture. Well, in the video below that I am posting only here on the Blog, I tell you just why that is and the situation surrounding the important role I assumed and am happy to take on for her during this time. This was personal and hard to share, but, I went there and after watching the video and hearing what I have said, you will then understand the “shower” ordeal much, much better, hopefully! Now, my son Taylor, well, that’s another matter all-to-together and he is sitting in a St. Louis County Jail as of today, April 20, 2014. I need your prayers – I need all of you to pray ahead and ask the Lord to send His Holy Spirit out and pour over, covering those hearts that will be the decision makers regarding Taylor’s future life and punishment. Pray that mercy is granted upon Taylor and that his punishment fits the crime and not an “example” made as so many judges love to do. Problem is, he has told so many fibs, tales and stories in the past, no one wants to believe him now…too many times did he cry wolf. Yet, I’m still his mother and I do not want him sentenced for being immature, hurt or due to the enemies constant darts he and his demonic forces throw Taylor’s way. We could have bailed him out, but we decided to make him face the court as now he has them going in 2 states – yet the confused child in him thinks it’a all one big misunderstanding. What do you do with a person like that? Well, I decided a long time ago to give him to the Lord Jesus Christ because there is nothing, and I mean nothing, that I can do for him but Jesus can. Now, I must do just what I ask all of you to do – walk in the Complete Divine Faith and Belief in the Lord without fear and without falter. I must (and I am) “whistling while I work” even when I want to bring out “Warrior Mommy” to pull every single string, favor and promise from all the people I know who can and may possibly step in to secure my request. What I cannot do is walk ahead of the Lord and take things into my own hands. Really…what kind of power and strength can these old hands hold, not an once I will tell you! I cannot step out of my “Concrete Footing” of the Lord – the one that I stand in each day…that same one that keeps me from falling flat on my face each day because of it’s sure footing, it’s sure grip upon my feet that holds me steady, straight and standing. When I stay/stand in this firm, unbreakable foundation, I am aware of my “Good Gifts” from the Lord, a “done deal” so-to-speak for my love and faithfulness and also the promises of His Word to me. When I walk with that pure peace upon my heart and spirit, how pleasing is that to the Lord that I praise and worship His Majesty and stand in “AWE” of his Great Glory, Mercy and Unconditional Kindness and Love during the lowest of times? I know that this is a time in my son’s life where he must do this by the book, on his own and face the music he thought he would never have to hear, again! I can hear the fear in his voice, the tears choking off his words and I know that he is scared beyond belief because it was just last week and last weekend that he was truly realizing just what it was in this life he had to do in order to be what he has been called to be and to do. The light bulb finally went on and stayed on but was it too late? Was this the time that the change was going to “take”, was it really here for good? He was studying his Hebrew books, DVD’s and CD’s trying to speak and read God’s Word in the Jewish form and was attending bible studies with his new boss who is too a believer, a devote Christian but believes in all the things we speak about here, and then Taylor was so excited about speaking at City Hall on Monday, April 21, 2014 regarding Obama Care and the RFID Chip that will soon be placed in all those who have signed up to receive this country’s new heath care. He was celebrating a “true Passover” as he described it and was eating only Kosher food items. When I talked to him on Thursday morning, he said, “Mom, I’m so hungry, I’m starving!” I asked him why he was hungry – asked if they were not feeding him, etc. and what came out of his mouth was so unexpected, I thought I was going to fall right off the chair, again! He said, “Yes Mom, they gave me food but I’m in Passover and I’m eating clean. I asked the guard if they had a “Kosher” meal that I could eat because it was Passover and I did not want to eat anything that wasn’t!” Really guys…what do you do with that? How does that NOT bring a smile to your face? I just cracked up and I have no doubt in my mind that Taylor was DEAD SERIOUS in his request because he truly wanted to please the Lord. It was his “cleansing” time as he had met some wonderful Christians (his new boss being one) and was studying each day the true Hebrew Passover and Feasts. Was this time truly the “game changer” or was it, just another failed attempt? Why is it that only when we are truly scared and “in-the-wilderness” do we see how great the Promise is? Why does it take famine over feast to make us see the error of our ways? To add salt further to the wound…he has not one person that believes a word he says now, even when he is telling the absolute truth. There is not one person, family or friend, who will stop on a dime and run to his rescue because of Taylor’s past “wolf cries” that all of us have believed in full-force right up until last fall/early winter. He is desperately looking for any ear that will hear and any heart that will open because he, in his “Taylor” mind, was/still is, changing his life and all this that was done in the past, when he just “lost” his way, should be forgotten and not counted against him because he is a different person. Again, what do you do with that? It’s more like a child looking for anyone to come into their nursery, arms up and reaching out over or through the crib bars, ready to secure themselves against anyone who offers to pick them up or pick up their fallen pacifier or bottle! Perfect example of his thinking: He drove to California and while there, didn’t veer over to the toll booth line and just stayed his speed on the highway where the “Speed Pass” cars drive – thinking, I guess, he could just drive through all of them without paying or thinking he didn’t have to pay if he did not have the money. Only for me, 2 months later, I receive tickets from that state for the “drive-through” violations. He still doesn’t understand what he did wrong there! How can this boy, or young man, be so genius-type smart, yet have not one ounce of “street-smart” common sense? How does someone get 27 tickets since January 2014 for the same thing (expired plate sticker and no current insurance card on hand) and continue without the knowledge of the “what and why” of what he did and continued to do to achieve this unbelievable number of violations? This is what I battle each day or at least 5 out of 7 days a week. There is something, a switch of sorts, that just does not click or spark in his brain, I know this because it’s been since he was 2 years old, but now, we have all decided if he is ever going to have a life, a good, productive adult life, then this is what we must do – but it still doesn’t mean my heart is not broken. Taylor can go to prison for 1 to 8 years or he could get less but as a mother, it’s a knife in the heart as far as the pain level, is it not? So, who is the one that has such power to make all the “right” things happen and all the “wrong” things go away, well, surely not me that is for sure because if I had that power, wouldn’t all this already been gone, never happening in the first place and never allowed to come back again? Yep, but since I don’t and it still continues to boil, I know only ONE who has True Power and that is the Lord Himself so that is whose Almighty Hands I put my son’s life in, His! My role as Taylor’s mother is to stay strong in my faith and leave it all and I do mean all, in the Lord’s Hands and allow His Mercy and Will to reign upon my son and all who pray for him. I must pray ahead that the Lord soften the hearts of man so that the enemy is not credited with a victory but cut down in motion and all the Glory, Praise and Love given to Jesus and our Father on the Throne. Turning around what was meant for harm to be in the end, a major moment of GLORY AND VICTORY for God, is what our Lord is an expert at so why would I not sit back in His firm footing and let Him work? Well? Exactly – so that my friends, is what I am doing and will continue to do and I intend to not only whistle, but I will sing all-the-while until this entire ordeal is over and the Lord’s Will is done! He knows who Taylor battles and Jesus also knows why so He will place him just where he is needed, where He needs him to be and or where he needs to be in order to learn so Taylor can fulfill his own role in these end times, for he has a special calling from God and Taylor too knows what is coming, how the events will unfold and has seen in detail the destruction, wrath and evil that walks this way and is soon to start. All I know, Jesus has him but prayers are always the bright white lights that beam up to the Throne Room of Heaven giving power to the words in those prayers being received at the Foot of God’s Throne and I ask for mercy upon his soul and heart when placed in front of the decision maker’s in this world but ultimately, it’s The Father’s Decision and Will that will be placed as nothing can happen unless God Himself allows it so give Him Praise, Worship, Thanks and Love! Just a note too – the baby shower was adorable and we were a hit! I will post about it tomorrow! Thank you friends and again, I’m sorry if I have not replied back to prayer requests/questions/emails – it’s been a “my plate is not only full, it’s spilling over onto the floor” kind of week! Tomorrow I will try to respond and reply. Happy Resurrection Day to all my dear brothers and sisters and may today and every day this week or the next, be the one day He is called to retrieve His Bride Home and may that day be upon us now. I truly cannot wait to meet you all as I know we are and will be the very best of friends! Daughter listen to My Voice for it is Me, Jesus Christ of Nazareth, Yeshua that speaks to you today. What you feel is Me, My Holy Spirit for it cries for those that do not know Me. Your heart breaks for the lost as that is the home in which I dwell. Warnings are coming now to all My Children as they can feel the destruction descend upon the earth. I am warning all that they seek Me and only Me like never before. Time is not the friend of the blind and deaf, those who refuse Me for their lives in this world are more than their life in Heaven which is now upon all who belong to Me. Cry no more for I have given them chance after chance to hear the voice crying in the wilderness. They refuse the God of Heaven and they obey the god of this world attached to their flesh. They have not eyes in the Spirit and scales are not falling so they must continue the course they walk blindly. My Messengers I seek now for it is their voices that are heard by those I wish to have hearing for they are faithful and true – they hear My Words and seek My Voice through whom I speak through. Child you must not let the enemy rest in you for he desires nothing more than destruction of My Chosen Children and will try to keep all he can from fulfilling their final race across the Finish Line as he will trip their feet as they near the Banner of Love that awaits them. Cross this for that is the FINALE which leads to Me and all My Promises. Do not listen to the whispers and do not turn your head to any direction other than forward for your Heavenly Home awaits beyond the Banner. I have given My Messengers My Voice for time is upon the earth – the time I have warned about and this generation will see the True Living Word…ME, just as written by the Prophets of Old. Listen to them, heed My Warning and settle your Spirit into the peaceful rest I have poured out. Call to Me, your Lord and Savior, for I hear you always. My Blessings are upon My Waiting Flock, My Waiting Bride for they are the True Watchers of this time. Set your face upon Heaven now as My Words become alive in the hearts of those who wait for My Spirit that is upon them; that lead them in Truth and those My Grace rests humbly upon. Watch the signs on land and in the sky. Is it too not the writing on the wall? All that has lain in plain sight can be seen in the open so it is not long hidden and this is how all who are Mine know the time I spoke of has come. Release your cries of hunger and thirst and I will satisfy each. Now is the Time of Glory and Destruction; the Time of Rescue and Judgment as division of the people has occurred and lines drawn. I know who call on My Name and I do not know those who do not. One more time do I give them a chance of introduction – one more time will I offer forgiveness for their ignorance and disobedience and that time is here. Pray they hear My Voice and pray in Petition to My Father in Heaven that they accept what only I can give; that they allow My Spirit that awaits placement a home in them that know me not. Child write these Words and know them, soon all of you will be with Me in Paradise as I will ready Myself to fulfill what has been promised and spoken. I know your sadness but you must continue to do as I ask. Walk through the stale air the enemy contaminates around you. Walk in The Spirit, My Holy Spirit and let Me carry you to your firm footing so you can steady your feet and finish the RACE as I have asked. Do not quit now for if you do, you give into the enemy and he will celebrate your tears as his victory. Do not let this happen for I have you and I will supply your needs and I, Jesus Christ, will cover your house with blessings – surrounding all with My Heavenly Angels for protection against the enemy’s army he sends out through the revolving door which releases false and evil with each turn. I have you! All I promised is now here – all will be as I stated. Cry to those who have not come from her, the evil Babylon as she has many names and associates. Come out of her Children, she is not your Shepherd, she is the wolf in sheep’s clothing that mimics all good things from My Father in Heaven and she misleads the feet of My Lost Sheep. Come out of her Children as it is time she falls. Cross the Finish Line and I await you there. I have you and I will not lose any who belong to Me. Stay strong in Me – cling to Me and love all as I do because now will be what My Watchers of the Day have been ordained to do. Now they will “ring the bell” to all lands and all peoples. I tell them now Watchers, RING THE BELL of My Arrival for the time of watching is over as I now come, now I’m here. Shout My Name and tell all I have come for the day has come. RING THE BELL that the Deliver has come now to bring His Promise! Well, again, I woke up this morning, popped open my groggy eyes but yet the first words out of my mouth was “Oh thank you Lord!” I am still aware when I sleep that I am learning something…again what exactly that is, I have no idea, but He is definitely downloading still. Last night, I had another dream of an Alien attack on the United States and/or World. Now, this is approximately my 5th or 6th dream regarding these demonic entities coming out of the sky since last September, 2013. I am not a prophetic dreamer in nature so at first, I just thought they were just dreams and mean nothing but after about the 4th dream, I realized they must mean SOMETHING! The dream I had last night, I did not even have time to run…once they were seen in the air, they were down, out of the crafts and killing everything that walked, including me. I just laid down, put my hands over the back of the head and closed my eyes because I knew there was no where to run, they had me but I knew as soon as it was over, I would be with the Lord. I truly had no fear. Now, I know when my friend Cherie who I was so blessed to stay with for 4 extras days after the Orlando Conference, reads this post, well, her ears are sure to spike because as we were driving to the beach one day, I saw something very familiar yet I had never been to that particular city/beach in Florida yet it all looked so familiar. I told her that in a few of the dreams I had, I was on a highway that was in between two-type bodies of water which I knew was on the Atlantic side of the country or state and I remember there was a slight up-hill overpass on this highway in the center of these waters. Well, here is where it gets good! As we’re leaving, she received a phone call by her best friend, another beautiful friend I made, Dr. Pat, and she was calling to say that the Causeway route they normally take (which takes you right there in no time flat) was closed and that we had to go around and take the long way to the beach. This meant nothing to me, but apparently, it was because Cherie was like, “Really? Are you kidding me?” So, off we were and once we started driving, I started remembering and then, there it was…that slight up-hill overpass I clearly saw in my dreams was right smack in front of us! That is when I said, “Um, oh Cherie, this is almost exactly what I saw and it was over to the right, over that body of water, that the “aliens” and their 100’s or 1,000’s of ships came from.” I told her how fast they came and how everyone started running – I even saw the little patch of trees where the people were running into trying to hide (me being one of them). I told her that I must have been an exceptionally fast runner because I didn’t stop until I was in California (ha ha) and was telling anyone who would listen about the attack on the East Coast but no sooner did I get the words out of my mouth, there they were coming in from over the waters of the Pacific Ocean and into California. What does this mean – I HAVE NO IDEA! Are these just dreams with no rhyme or reason as most dreams are, especially mine? They could be and I am in no way, shape or form, telling anyone who reads this to believe this will happen or is going to happen just as I’ve seen and told. Do I think there is a deeper meaning behind them…yes, yes I do because of the specifics in each dream but will this happen the way I dreamed, most probably not but it was, I believe, the Lord showing me what, along with everything else, is coming upon the earth. Now, having said all this, I received an email this morning from one of my dear sister’s in Christ who is a true Daughter of the Lord and receives (and has posted) many messages from the Lord telling me to watch this video. This was in response to another very heavy message I received on April 4th, 2014 in which the Lord was giving huge warnings, not only to me to write, but also through my other 3 friends who He calls “Daughters”. I cannot release it yet, but I am just waiting as I feel permission will be granted anytime, I truly do. In this message though, I was given a specific day-of-the-week, not a DATE, but a day (ie. Monday, Tuesday, Wednesday, etc.) but it meant nothing what-so-ever to me. Well, sure enough in the video I was asked to watch, the day matched and this is why my friend thought I might need to see it as I truly had no understanding of this day and why He would mention it to me or have me forward to another because they would have understanding of what He was saying regarding this same day. Did I lose you there? I hope your still with me in this because this is exactly how Jesus confirms each message He gives…confirmation always comes via these 3 friends or another message from someone I have never seen or heard. I wish I could post the transcript of what I read today but as of yet, I cannot but it has to do with those demonic aliens and their soon arrival on this earth. They will come, introduced to the world as peaceful entities caring for the people of earth but in reality, they are demons in disguise and have come to kill. This time is similar to the date we are looking to this month, the day of Passover and “tax-day” as this day is HUGE on God’s Calendar, His Gold Ring in Heaven which does not measure time/dates/hours/minutes as we do, but by EVENTS and the passing of those said EVENTS! 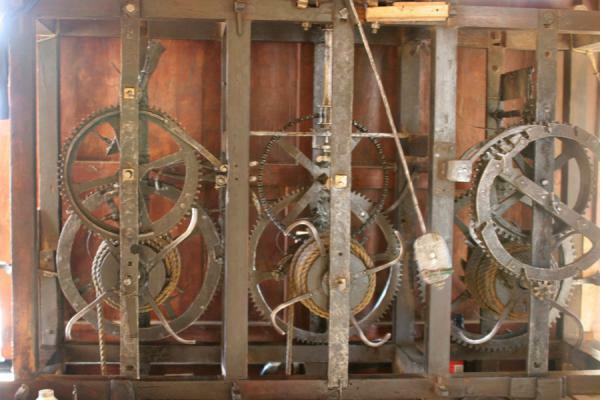 Although I have never seen God’s Gold Wheel Clock in person, below is one of the oldest clocks in existence. This is just me thinking out loud and visualizing His Clock of Events/Times. I see as much smaller that sectioned out below, but the mechanics, the cogs is what I think is important. I see it as just one large piece with multiple wheels within the one large wheel. Why doesn’t anyone know the day or hour that God the Father will send His Son, Jesus Christ, Yeshua, in the clouds, saying, “Now, go get your Bride!”? Jesus says that not even the “Son” knows this time and now we all have been given to reason why this is – there is no day or hour to know. Since God has already spoken His Word into existence, it must happen at the appointed time, a time however we do not know. He spoke these EVENTS into play at the beginning so each must exist and come-to-pass as spoken but we have no idea what they are or the exact timing of these to which they will occur as there is no set day or time, only the Word of God who gave them life and now, are just waiting for the cogs on His Ring of Events, His True Measure of Time, to turn. As I have said before, there are many events that are yet to be seen, yet to happen, but we, the Bride of Christ, are only awaiting ONE. One EVENT that needs to occur before all that I have shared with you, from what I have been taught, along with a few hundred more, over the past 18 months. The Lord keeps repeating to us over and over that the earthquakes are a sure sign and that the alignment in the sky is surely there for us to watch and see…that the timing of His Coming is right there in front of us, all is in PLAIN SIGHT! He has told us that we are in the Season of His Return and now He has clearly told us to “READY YOUR FIELDS AND READY YOUR HOUSES”; He wants us to make sure we have planted our seeds, watered our seeds and have tended to our fields as all good workers of the field do. We are the Vineyard Owner ‘s (God) farmers, field workers and we must continue to produce a good harvest but at the same time, we need to know when one or more of the Vines or Trees that we watch over and tend, is not growing nor receiving “good nutrients” needed for their growth, survival and are in danger of damaging or destroying the “Good Fruit” they were planted and designed to produce. We must realize where our limited ability is, just what we can do and not do, knowing how and when we must give these who are in danger of decay and rot, over to the Vineyard Owner as it is for He Himself, to oversee their healing, growth and life as only the Owner knows His Field and the soil He plants on. We do not have the tools certain Trees in the Vineyard need to survive in order to be a good producer of the fruit it was designed to produce and harvest – only the Owner Himself carries that knowledge and wisdom and it is only He, The Owner, that has the ULTIMATE POWER to decide which must be cut down, which He will allow another chance and which ones He is ready to reap, ready to Harvest because He has tasted their fruit and it is GOOD! He has the overall say in all these things – not the worker, and we are to do just as we are told but to, learn all He has shown and taught us so we can plant in the good soil that pleases Him. Bottom line to this – WE DO NOT HAVE THE POWER NOR THE ABILITY TO SAVE ANYONE ELSE UPON THIS EARTH…WE ARE POWERLESS IN OTHER’S SALVATION AND ALL NEED TO RECOGNIZE THIS NOW! But, we all need to know what we can do, what capabilities we do have and that is the POWER OF PRAYER! We can pray in Jesus’ Name to our Father in Heaven, God Almighty who sits on the Throne of Heaven, that He, and He ALONE, removes the scales from their blind eyes and He, and He ALONE, opens up their ears so they are no longer deaf, unable to hear His Voice and Call. They cannot SEE nor can they HEAR what we do as God Himself must grant this, must allow this GREAT BLESSING AND GIFT! Remember, we, all of us, are truly praying for the afflicted, the truly BLIND and the truly DEAF born into this world. 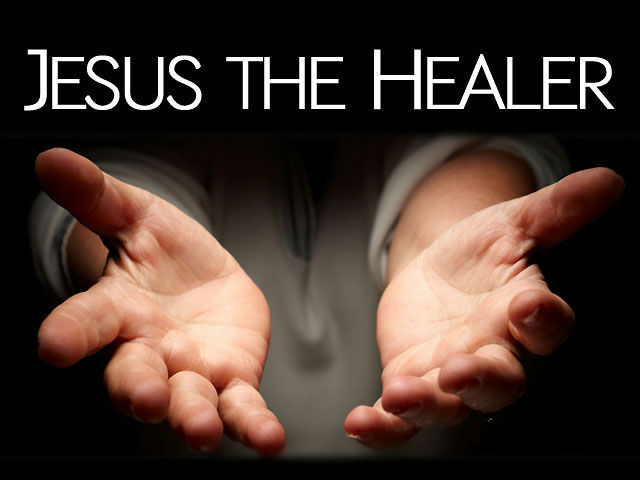 Who was the Great Healer of these curses in the Bible? Jesus, right? So why would we not go to Him now as done in the past? You, we, all of us who so love the Lord, must again pray ahead and ask the Lord to allow this transformation, this healing in those we love and care about but you must do this NOW! They cannot see that what we are trying to share with them is LOVE COMING DOWN as they cannot see at all – it is like a veil of darkness covering their spirit, thereby blocking the Divine Light we are so passionately trying to place around them or in them…we just want them to see “The Light” that fills us, guides us, teaches us but more importantly, loves us. We cannot shake sense into them nor can we talk to them till we are “blue-in-the-face”. Ask the Lord to do this work, to give this blessing and then, move on because while we are spending to much time in this one spot, we are neglecting our field, our other Vines/Trees that the Lord asked us to attend, to work and to water. We are not the Savior, Jesus is but He, through His Holy Spirit, His Helper that He sent us, can do great things and through The Helpers’ Great Divine Power, we can ask Him for His Greatness through prayer and this my friends, is where our power lies…it lies in all things Him. We must remember in these last days that we walk in this…”just BE and let Him DO!” Today I ask that all my “friends-of-heaven”, give them up, give all you have been trying to save, to the Lord Himself and let go as this is where your power lays, no where else. Give them ALL to Him, release your prayers up to the Throne of God and walk away but walk away whistling, walk away smiling and in joy because you know your Father in Heaven holds the only True Power of Change these blind, deaf loved ones need and that He will do what He ordained to be done from the beginning.